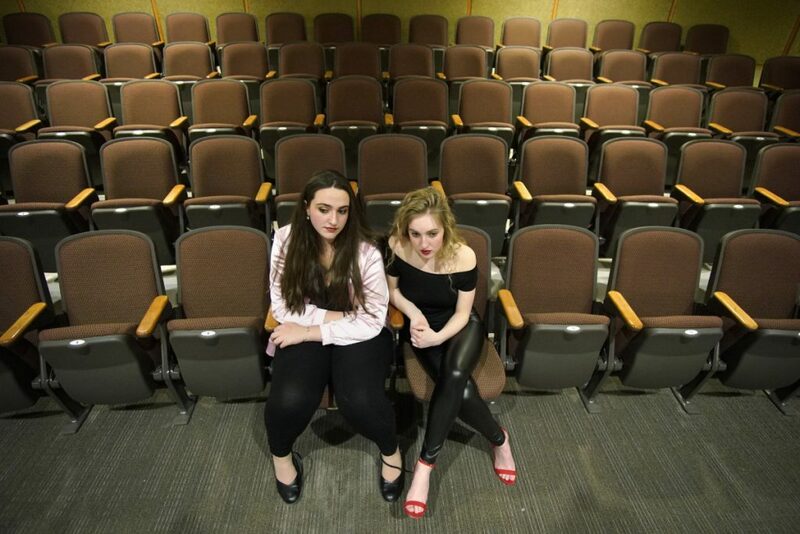 Two friends with a love of theater rehearse and support each other for months, culminating in performances in the musical 'Grease' with the end of senior year on the horizon for one. 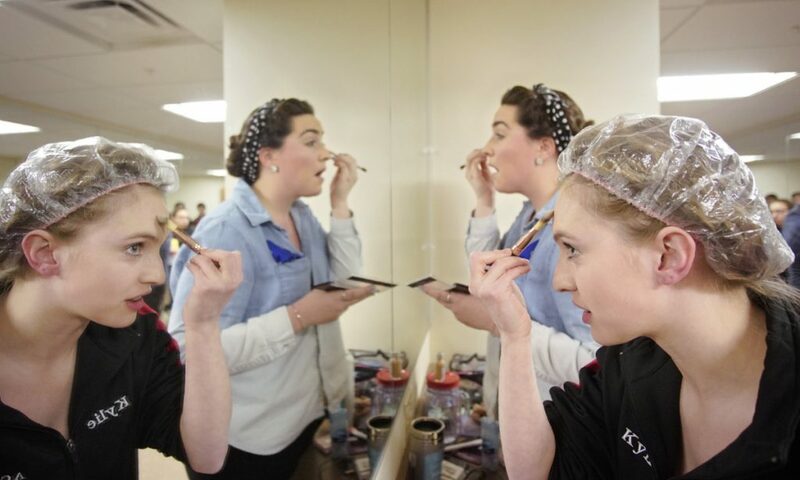 WELLS — The hum of the audience settling into the auditorium filtered into the makeup room as Kylie Belanger shook out the curls she painstakingly put into her straight blond hair. It was minutes before Belanger’s last set of performances on the Wells High School stage. 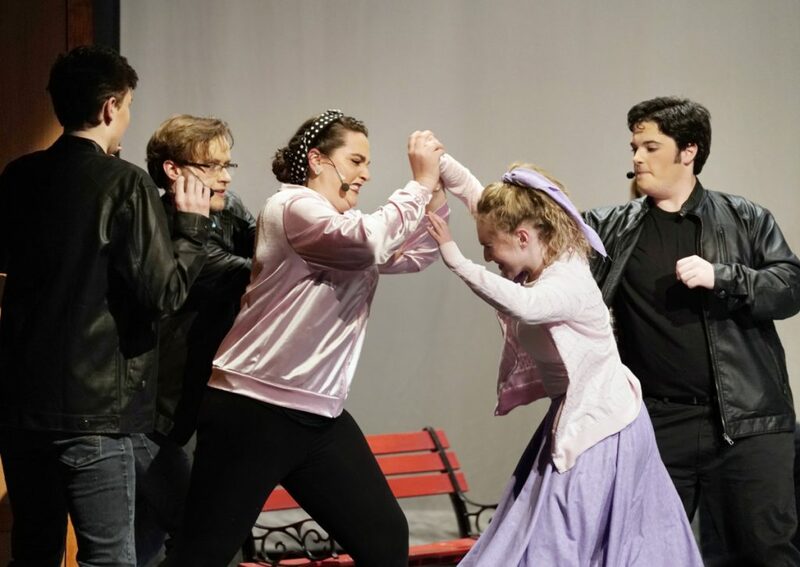 “I keep saying to myself, ‘I own this,’ ” Belanger said of her role in “Grease,” the musical brought to life on stage by a cast and crew of 47 students. After months of rehearsals, she was only a little nervous about stepping on stage. It helped that by her side was Delaney Bailey, who plays Sandy’s adversary Betty Rizzo. They kept each other sane on their off days, always cheered for each other and dissolved into laughter while rehearsing their fight scenes. Belanger, 17, first appeared on stage in seventh grade, playing Thumbelina in the junior high musical. As much as she loved singing, she turned her attention to soccer, basketball and lacrosse. All along, her theater-loving mother and grandmother suggested she get back in the spotlight. 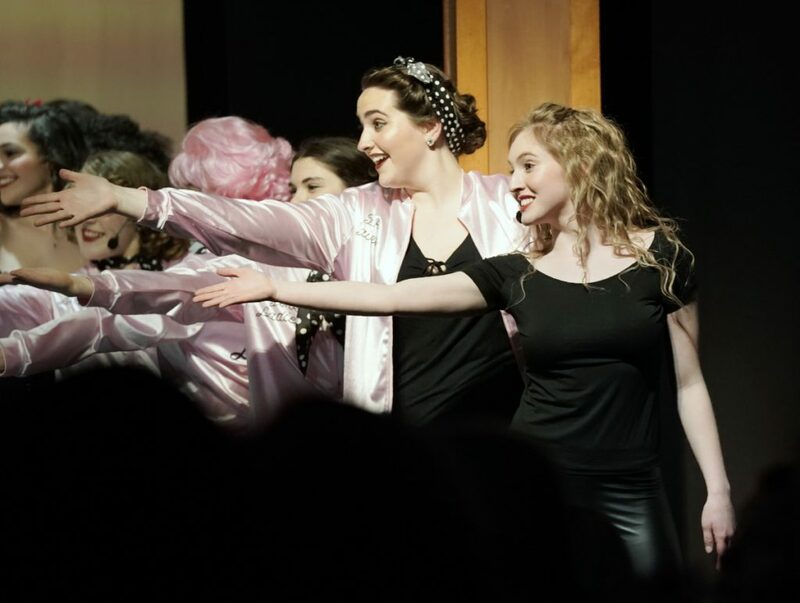 Belanger auditioned for the school’s a cappella chorus during her junior year and still sings as part of the select group, which also happens to include Bailey and the rest of the Pink Ladies from the “Grease” cast. This year, her senior year, Belanger finally decided it was time to return to the theater. She auditioned for the fall production of “The Crucible” and was cast as Rebecca Nurse. She had 12 lines and spent her downtime backstage doing homework. In January, she landed the role of Sandy Dumbrowski. “My mom is in her glory,” she said. Bailey, 17, can’t recall a time she wasn’t drawn to the stage. She was in fourth grade when she made her debut as the Cheshire Cat in a community theater production of “Alice in Wonderland” and was in every school play in junior high. During the fall of her freshman year in high school, she auditioned for the play and was cut. Months later, she landed a lead role in “Godspell” and gained confidence as she acted alongside upperclassmen. Since then, she’s played the Bird Woman in “Mary Poppins” and Elizabeth Proctor in “The Crucible.” Betty Rizzo is her favorite role. It’s also been her most challenging role because Bailey isn’t mean – especially to friends like Belanger. Bailey and Belanger have spent nearly every day together since the Jan. 8 auditions for the musical. The people casting the show knew immediately they were perfect as Rizzo and Sandy, said Andrea Hernandez, the assistant director. 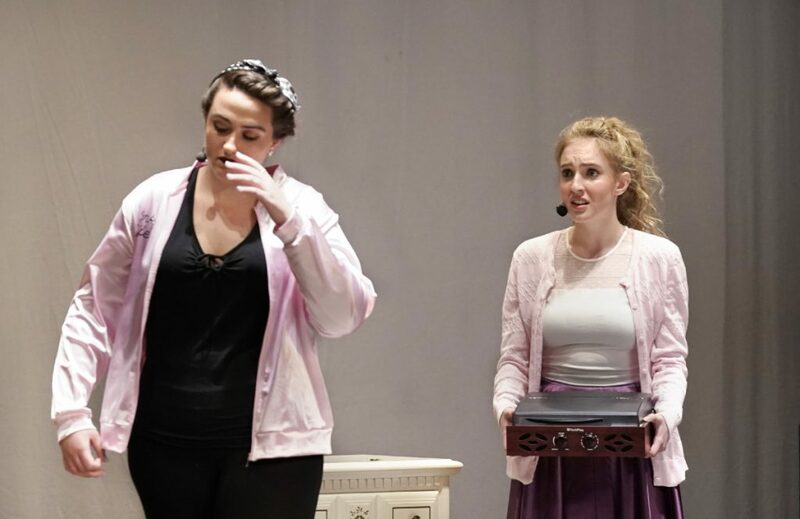 The cast says everyone in the play seemed to end up playing a character with a personality similar to their own, right down to the girl who loves to snack as much as the Pink Lady she plays. Director Andrew Lopez said Bailey and Belanger have been extremely dedicated to the play. Two days before their first scheduled performance, the cast gathered for a dress rehearsal with costumes and props. The run-through was a success, but it could have been better, Belanger said. But the directors were pleased with their performances, offering only a couple of small critiques during a cast meeting after rehearsal. The show was ready, but everyone worried a nor’easter bearing down on Wells would force them to postpone opening night. Hernandez told them not to wish for a snow day. Belanger said she was praying there would be school. “I’ll go to an extra Mass this week,” she said. School was canceled the next day and the day after that, postponing the first show and canceling the teasers they usually perform for their classmates. Belanger spent most of the day off doing homework and hanging out with her sister, Jordan, who is part of the “Grease” ensemble. Bailey, meanwhile, played board games with her family and tried to avoid most of the shoveling. “I was like, ‘I have a show, I can’t be shoveling,’ ” she said. An hour before the show, Belanger and Bailey stood together in front of a mirror backstage putting the final touches on their makeup. The room around them buzzed as actors styled their hair and double-checked that costumes were in place for quick changes. Bailey gave out handwritten thank-you notes to all the Pink Ladies and Burger Palace Boys and told her friends she’d cry if they got emotional reading them. The note Bailey gave Belanger thanking her for her friendship and hard work calmed Belanger when she got nervous right before the second act. “Tonight is the night you’re going to knock it out of the park,” Lopez, the director, told the cast. Eight minutes before the show, the auditorium was full and the cast was ready. Really ready. Backstage, they circled around Bailey and Katie Reidy, who led them through their pre-show ritual featuring silly songs and a random line from the show. Tyler McDonnell, already embodying the character Kenicki with cuffed jeans, Converse sneakers and some salty language, ended with an enthusiastic pep talk that sent the cast into bursts of laughter. On stage, the actors sang, swayed and hand-jived their way through the show. The audience reacted as the actors dreamed they would: hooting at smart-aleck comments, laughing at all the right times and singing along with every song. Bailey could hear her godmother cheering above everyone else. 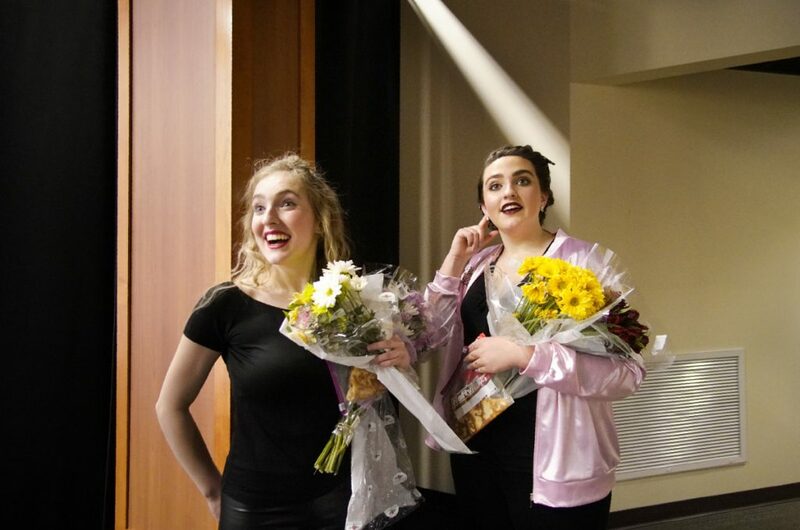 Bailey sang her first solo near the end of act one, her voice clear and sassy as she mocked Belanger’s character in “Look at Me, I’m Sandra Dee.” The applause after was thunderous. Backstage, Belanger was still a little nervous about her first solo, but calmed down as she watched Bailey. And then it was Belanger’s turn. She took a deep breath and stepped onto the stage. Her mother, who helped her run lines, listened from the audience. A few feet away, just behind the curtain, her younger sister sang along softly as Belanger began her solo.